Last Sunday I carried nearly 5 kgs of moringa pods (drum sticks) to home from my farm. I was visiting my farm after nearly two weeks. I don’t stay away that long from my farm that but I couldn’t help because I was amidst thousands of Swiss-made watches at the watch show held at Basel, Switzerland. I had a job to do: talking to the CEO’s, attending the launches and being shown through the novelties. All along I was missing my weekly chat with my favourite totapuri mango tree and the Muzzafarpur-born litchi plant and now growing at my farm. I have two moringa trees which I planted some eight months back. I never realized that they will be the first to fruit, and have distributed the sticks to friends and colleagues. These moringa pods were fleshy which gave my wife the idea to try out a new dish. And she made what I would call, a moringa bharta. It was really palatable and had a crunchy feel. Cut the sticks into pieces and put them in a cooker. Remove it from the gas after three whistles. Remove the sticks from the cooker. Let it cool. Squeeze the seeds from the sticks. Add oil to a frying pan and fry diced onions, haldi and zeera. Add the seeds. Don’t throw the water in which you cooked the moringa. Its rich in nutrition. You can use instead of plain water to cook your dal. A year back I had planted two moringa saplings. In fact, they were brought by Man Friday, Mangal and planted at the edge of the plot alongside a neem. 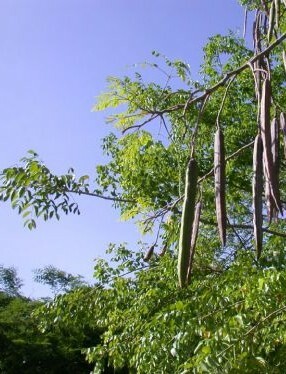 This Sunday while visiting my garden I saw the stick-long fruits (moringa pods)crowning the trees. Both trees have grown to the height of 30ft. Unable to reach to the fruits I did the easiest thing: shook the branches. And the fruits came down in showers—one, two, three… I collected around 50 of them. The fruits are not much thick. Not much thicker than my fingers. The Hindu reports that one Alagarsamy in Dindigul district, Tamil Nadu has developed a high yielding moringa (drumstick) variety named PAVM which yields for nearly 8-9 months a year. According to P. Vivekanandan, Executive Director, Sustainable Agriculture and Environmental Voluntary Action (SEVA), Virattipathu, Madurai the variety has become such an instant hit with hundreds of farmers in Dindugal, Coimbatore and Erode areas that even scientists from the Horticultural College and Research Institute (under the Tamil Nadu Agriculture University), Periyakulam are all praise for Algarsamy’s path breaking finding. According to Alagarsamy if organic practices are followed, the fruits become fleshy and weigh about 200 gm each and stay fresh for nearly a week. 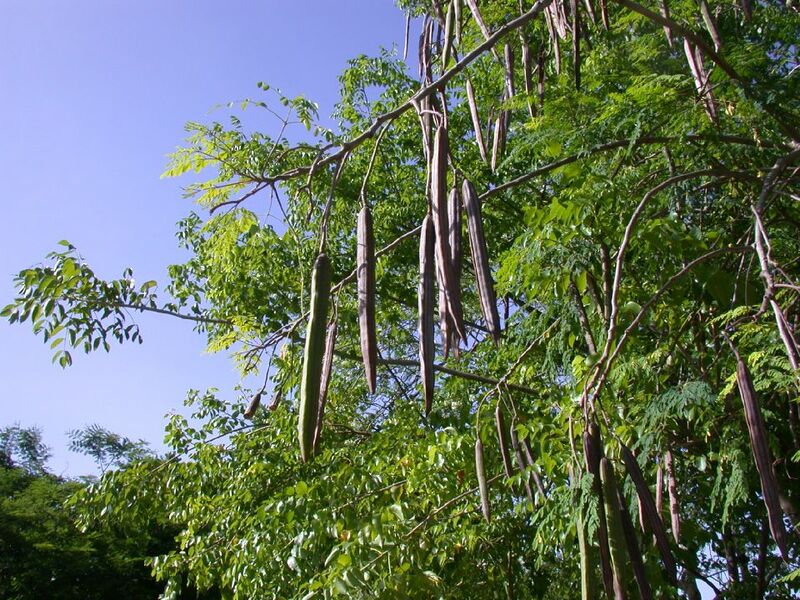 Annually about 20 tonnes of moringa pods can be harvested (at an average of 100 kilos per tree with 200 trees in an acre) from this variety. In a year about 2.5 lakh seedlings are produced from Alagarsamy’s nursery which fetches him a profit of Rs. 6 lakh a year. Readers can contact P. Alagarsamy at No:6/39, south street, Pallapatti, Nilakottai Taluk, Dindigul, Tamil Nadu. M: 98653 45911 / 97917 74887 and P. Vivekanandan, email: vivekseva@dataone.in. T:0452-2380082 and 2380943.